These three things will allow for future portability within the python world and allow people to write their own plugins, patching methods, and extend functionality. Yes I want to implement drop-in code injection/patching methods. It will happen, I just need to re-write some of the core BDF code. So starting with this post I'll be explaining the preprocessor addition, added in version 3.4.0, in a first attempt to extend functionality. Preprocessor scripts are just that - python code to do X. Whatever X is. I've included a couple examples in this release, in the preprocessor directory, to help explain what you can do and there will be more examples in the future. The main reason I came up with the preprocessor was that I was tired of modifying core BDF code to test an idea or concept. With preprocessor you can write whatever you want without mucking up the main code... well unless you muck up the main code in your script. And that is correct, there are no safety checks in the script loader. If you want to write os.system('rf -rf /") in your script YOU CAN! So be careful running third party preprocessor scripts. The preprocessor functionality is enabled by the "-p" flag in BDF. They run in alphabetical order. Your script must be in the preprocessor directory. One tempfile is created for all preprocessor scripts and is passed from one script to the next before being passed to BDF for payload injection. The modifications to the tempfile, before payload injection, can be saved for inspection and troubleshooting. Just copy that script to a new one. Afterwards open the file for editing. recheck_support (True or False) - This pushes the tempfile through the support check function to ensure changes, if any, did not break patching candidacy. file_format (PE, ELF, Macho, or ALL)- This sets what file format your script applies to. The '-q' flag is to silence the ascii banner. 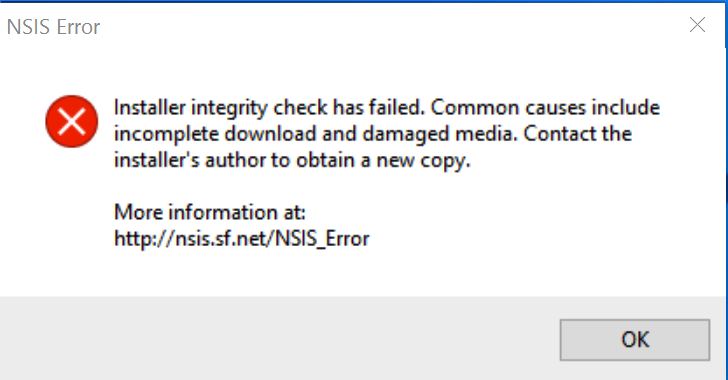 NSIS is a windows installer, mainly used by sourceforge binaries, that has self checking mechanisms to ensure integrity before installing. If the binary is modified within certain ranges you will receive an error like so. Since there is no cryptography involved it pretty easy to bypass. And there are two ways to do it. 1. Find the CRC32 test/cmp then conditional jump in ASM and patch it out. 2. Or, find the CRC32 location and update it. For demoing the preprocessor, I'll just do the first one. print "\t[*] NSIS 3.0 Binary loaded"
print "\t[*] NSIS 3.0 Binary NOT loaded"
print "\t[*] More than one binary match, picking first"
So what is going on with this script? All I am doing is verifying that the binary is a NSIS binary by checking that three strings exist in the binary and then flipping a bit to set the CRC32 compare result check from jnz (jump if not zero) to jz (jump if zero). 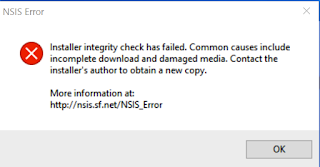 So when we change the contents of the file, it will not be zero, there is no error message during execution, and no program exit. You can also access the PE information with self.BDF.flItms, it is a python dict and should be fairly easy to understand for those familiar with PE files. flItms is short for File Items. For the macho and elf files, it is in self.BDF namespace, there is no 'flItms' object as the ELF/Macho formats are fairly easy to manipulate. You'll see here that the TempFile is saved and will be in the directory where you executed BDF from. However, because no modifications were made to the part of the binary where the CRC is checked, you'll receive an error message if you attempt to execute the temp binary unmodified (pre-patched state). Note: this might fail on non 3.0 NSIS binaries. I also added the debug preprocessor, it is enabled by default. When reporting any issues with BDF I recommend including the output in the issue report.